Bioware's new world is big and makes an Anthem guide invaluable, because the moment you step out of Fort Tarsis there's a lot to learn. From the best Javelin, to tomb challenges, treasure chests or how to get multi kills. Anthem is a world full of things to find, work out and, well shoot basically. And our Anthem guide covers it all and will make your progress far, far easier. Our full Anthem review is now live, and we've provided our complete verdict on the game after some 30 odd hours of play. The TL:DR version is that it feels like an empty, utterly frustrating mess that's no-where near done. Multiplayer isn't all its cracked up to be, and although the story picks up in the second half of the game, it's not the BioWare magic that we were expecting. When you get started, there is a lot that Anthem doesn't tell you. In fact there's so much, you're expected to delve into the menus and read the extensive cortex to find out. Make sure you have the best start possible by following 13 of our Anthem tips, because unless you're an Anthem aficionado, you're going to need them. After you play the prologue, you'll be required to pick your Javelin. But with four to choose from, how do you know which is best?! Luckily, we've done the work for you. Our best Anthem Javelins guide takes a look at all four Javelins so you can decide which Javelin is the right one for your playstyle - and the strongest. With all of that said, it's no secret there are some serious Anthem problems. From the strict teleportation when you're just a few steps behind your teammates to the lack of waypoints and severe amount of loading screens, the upcoming day one patch will likely fix some but not all of the issues with the game. Make sure you have a look if you're on the fence about picking Anthem up or not. Very early on, you'll meet Prospero in the Fort Tarsis market who wants you to go into the Bastion and search for Ember. How to get it isn't properly explained though, so follow our Anthem Ember guide for more information on how to get it, where to find it, and what to do with it. We'll leave the discussion around microtransactions in a £50/$60 game to another day, and instead we've simply taken a look at the Anthem microtransactions. We've got everything you need to know about how the Anthem store works, what you can buy, how much everything costs, what the different types of currency mean... you know the drill. You'll reach a point in Anthem where you'll encounter the Anthem Tomb challenges and be dumbfounded that such filler content could be thrown into the middle of a promising game. You have to complete the Challenges of the Legionnaires which involve things like 50 melee kills, 15 combo triggers, 25 harvests and more. The reward you get is really cool and worthwhile though, honestly. One of the challenges for the Tombs of the Legionnaires involves opening 15 chests, so we've done a detailed guide on where to find a lot of Anthem treasure chests and an easy route to farm them all. Fly through this a couple of times and you'll have found enough chests in no time at all. Another challenge you'll need to tackle as part of the Tombs of the Legionnaires is obtaining a number of multi kills for the Trial of Cariff. This isn't as easy as it sounds, because Anthem defines multi kills differently to most games. 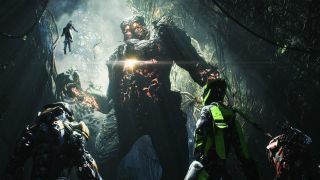 To find out more and get some tips for completing the challenge, take a look at our how to get Anthem multi kills guide. Since the main story for Anthem is much shorter than expected, levelling up to the endgame content can be a slog. If you're finding that applies to you, why not learn how to level up fast in Anthem? From legendary contracts to upping the difficulty, we've got a number of tips to help you reach level 30 in no time at all. If you've jumped into Anthem but you've not the foggiest of ideas what's going on, you're going to want to take a look at the Anthem story explained by two of the lead writers at BioWare. From background lore and the individual characters, to the Legion of Dawn and the Heart of Rage, everything is covered here so you'll be in the loop when you progress through the game. Before Anthem launched, we spent two weeks delving into the game and discovering what BioWare's brand new IP was all about. Featuring countless interviews from people who worked on the game, a piece on how Anthem can learn from other games in the genre, and how Anthem was almost a free-to-play game and more. It can all be found in our On The Radar Anthem page which contains all of our On the Radar: Anthem features, interviews and news.